Auto collisions are frightening. 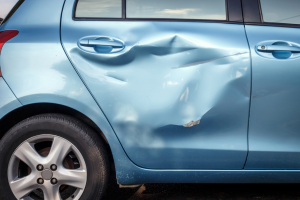 After an accident occurs, often the first reactions are to see if the driver or passengers have undergone any physical injury or trauma during the accident. The secondary thought that generally comes to mind is whether the car is in working condition or not. Part of assessing car damage is determining if the car frame is bent, and whether it can be straightened or repaired to bring the car back up in working condition. If your car is still aligned and drives in a straight line, you could drive it even with a slightly bent frame, but at your own risk. A bent frame compromises the strength of your vehicle and it will not be as sturdy and safe as it was before the collision. The aerodynamics of the car will likely be altered as well. The best way to assess the severity of a bent car frame is by having it checked by a professional auto frame body shop in Elmhurst. This is the easiest way to detect a damaged frame. Walk around the car and inspect it carefully to check for any signs of cracks, rust or creases on the exterior of the car. Another way to check for damage is to get under your vehicle and safely look for any signs of damage on the bottom of the frame. When a car frame bends, it can cause squeaking, creaking or other similar noises. Notice if the sounds are coming from the front, rear or from either side of the car. If you’ve heard any of these unusual noises, it is best to get the frame checked by a professional auto body shop. The suspension of your car, as well as the shock absorbers, are likely to wear out unevenly if the frame is bent. A quick check on the suspension and shock absorbers can determine if there are any signs of uneven wear or weight distribution on any side of the car, due to the bent frame. The alignment and suspension of the car can be affected if the frame is bent, which can quickly cause uneven tire wear. If you are regularly performing tire rotations and are still noticing uneven tire wear, it could be an indicator that the frame is bent. The windows, doors, mounts, and bolts are places where you can check for a bent frame. Since the frame is the foundation on which all the other components are built, if these parts do not function accurately (i.e. they either show signs of stress or have too much or too little room), it might be due to a bent frame. Commonly known as dog walking or crab walking, this is when you’re driving straight but your vehicle feels like it’s pulling either to the left or to the right. Your car should be able to drive in a straight line when your steering wheel is directly centered. Looking for an Auto Body Repair Shop in Elmhurst, Illinois? Have you been involved in a car accident recently? Or is your car not working as smoothly as it used to before? The reason could be that the suspension is damaged or that the auto body needs repair. Lombard Body & Fender has served the Elmhurst area for 47 years. Regardless of the make and model of your vehicle, our technicians have the experience to get your car back up and running smoothly.